Workshop and performance dates, times and all arrangements are vital to the success of this exciting caravan tour. This is an exceptional opportunity in the HERE AND NOW. So much energy and inspiration is being generated to make this happen. We are doing this only once (and we havent done it yet). We need your assistance! Opportunity is knocking at your door today!! So LOOK OUT, here she comes . . . with Sirocco! We are all working together, to make this happen! With this tour, we are creating a chance to see and experience a quality of belly dance that is being lost to America these days. This is where the dancers and musicians push the envelope during performance, and transport YOU to their realm of art, magic, music, dance . . . and beyond! In the 70s and 80s, a typical night club show was 30 to 45 minutes long. Now, there are very few venues for professional dancers to perform for more than 6-7 minutes. In the longer forms of bellydance, different mind-body chemistry and modes of expression emerge, those which artists are not able to attain or develop a mere 6-7 minutes. (see article on 7 part routine). Our caravan show will feature Delilah, Sirocco, and special guest dances by Delilah's daughter Laura Rose, our sponsors if they so desire, and perhaps a couple other guests. We are looking forward to taking you on a dance and music adventure! In our music workshops we want to seed more interest towards folks playing the live instruments that are traditionally used in the dance. 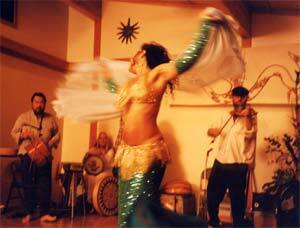 This way we will all have more live music available for belly dancing. The relationship between dancer and musician is truly an art. When a musician plays for a dancer it is a very different experience for the musician. When a dancer dances with a musician it is a very different experience for the dancer. When we as audience witness this creative interplay it is a very different experience as well. Only by experiencing these things can be know and uphold the appreciation for these arts in our culture. DRUM WORKSHOP... Uncle Mafufo is an inspiring master at teaching drum and percussion workshops for dancers and musicians. Many have discovered how beneficial and therapeutic playing a drum can be for body, mind, and balance. A dancers dance ability will undergo big changes when a deeper understanding for the construction of music and rhythm is cultivated. Husbands and friends love to participate in the dance with their partners and playing a drum is a wonderful way. NEY WORKSHOP... Sulyman El Coyote can lead a class on how to make a proper nye out of PVC. Every one will make an instrument in this class and begin to make the breath sing through the reed flute. It is said the ney represents the human body through which the inspiration of life passes. To learn to play the ney is a very soulful path. PRIVATE DRUM OR MUSIC LESSONS... Uncle Mafufo and Sulyman El Coyote are available for private lessons and coaching by advanced appointment. All interested persons can contact Delilah and she will help make arrangements. PRIVATE BELLY DANCE LESSONS WITH DELILAH. . . Check out her class menu page for couse ideas and make an advanced appointment with Delilah and she'll be glad to arrange appointment times and places as time draws nearer.  Drumming is Good for You!  Let's get this show on the road! Support your Caravan belly dancer! Buy a sports bra! Limited edition. Available soon . . .on line too! See the Visionary Dance Events Calendar for a complete listing of upcoming workshops and shows!